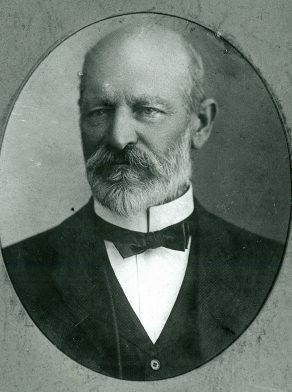 Frederick Charles Passau was born on 30 April 1842 at Glebe, son of Samuel Passau and Matilda nee Dawes. On 1 November 1864 he married Rachael Benton at Scots Presbyterian Church in Sydney. There were six sons and four daughters of the marriage. He died at Manly on 9 July 1919, aged 77 years. His wife Rachael Passau died on 3 November 1905, aged 62 years. Described as a jeweller, he lived in St Johns Road Forest Lodge from about 1871 and at Bessmont Terrace St Johns Road till 1883 when the family moved to Manly. He leased two jewellery shops in the Sydney Arcade from 1886, and in 1904 he was working as a watchmaker, jeweller, spectacle maker and optician in the Royal Arcade,at 494 George Street, Sydney. In appealing for the support of the ‘Working Men of Forest Lodge’ in 1874, Passau proposed meetings in council chambers to be held at night to see how their councillors voted, and advocated the formation of a mechanics institute to elevate the ‘intellectual condition of the people’. Prominent in formation of the Derwent Cricket Club, and club secretary 1876-79, he received an illuminated address for his services to the club. He was auditor for Glebe Council in 1880, an active member of the Royal Foresters Lodge and Worshipful Master of Glebe Masonic Lodge 1885. After moving to Manly in 1887, Passau became a driving force behind formation of Manly fire brigade and its station in Fountain Street, Manly. Frederick Passau was an alderman on Glebe Council from 1874 to 1876. Passau continued his association with local government after he moved to Manly. He was elected to Manly Council from 1887 to 1906. As Manly’s mayor in 1897 and 1898, he was heavily involved in the connection and improvement of the water supply to the Manly municipality and the establishment of a sewerage scheme that was finally completed in 1899. Passau was also a driving force behind formation of Manly fire brigade and its station in Fountain Street.